Showing results for tags 'low mileage'. Hi , my name is Derek and I live in North Ayrshire . Being of a certain age , I’ve had lots of cars down the years and am a big fan of the German marques . My parents ran VW’s and Mercedes from the early 60’s onwards , and I’ve followed suit . We had more than a few air-cooled Beetles , then the Mk1 Polo and Derby , Every mark of Golf from the 1 to the 5 so far , Mk 1 LS and GLS Passats and a Mk 2 GL5 estate , also had original Audi 100GL for a while . Back to Polos , we’ve had several Mk 2 , both 1.05 and 1.3 litre versions , my sister had a 1.9D Mk 3 , my daughter currently has a 1.4 auto Mk 4 , and the reason I’m visiting here is I just bought a minter of a 1.4CL Mk 3 (6N) in Candy White , totally original and owned from new in one family , with only 19K on the odometer. i was looking for a cheap stopgap of a car to use while I swap the diff on my 190E ( another story ) and came across this little gem of a car . This car is so original and unmolested that I’ll be keeping it just as it is and trying not to put too many miles on it . The one thing I will be changing is the naff set of Halfords wheeltrims cuttently adornimg it - I seem to remember my sisters Mk 3 had metal VW hubcaps ? So I’ll be looking for the authentic items . I paid a deposit on the car earlier tonight ( last night - Tue 6th ) , sorted insurance and will take delivery tomorrow , no tonight , Wed 7th . Because of the condition and low mileage , I think I’ll try and keep it in the family as a spare car , to be used sparingly and only when needed - it would be a shame to start racking too many miles onto it when so far it is 22 years old with under 20K on it . Still , it’s the youngest car in my current ownership . 86c Coupe, One Owner from New! Hello there! After a lengthy time away from Club Polo I return with a 2f Coupe! Always said I’d get one. ?? Some of you on here will remember me from a couple of years ago, I had a 1.4 8v 6n, then a 1.6 mk2 Golf and also a 1.4 16v 6n. All the threads are probably still on here! Story goes as such, I’ve been driving a 1.8t Leon and I’m facing the prospect of motorway miles, so I was actually looking for a diesel. 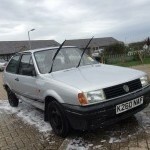 Browsing the marketplace on Facebook and I see an advert for a 66k miles 1.3 Polo Coupe for £400. Messaged the dude and had a bit of a chat and decided it was best to go have a look. It belonged to an elderly lady who bought it brand new from the dealer and unfortunately recently passed away. Now, the paint/bodywork is really quite tatty and needs a lot of fixing up, but it’s all still very treatable. It desperately needs a new bootlid! The important thing is that, after a bit of haggling, I’ve bagged myself a one owner from new Coupe with only 66k genuine miles on the clock. Even still has the original dealership plates on it! The dealership doesn’t even exist anymore. It’s the 1.3 AAV (I think) motor with a 5speed 8p box. It was a little reluctant to start as the last time it ran was the beginning of August when it went for its MOT and its sat ever since but I coaxed it to life and drove it home and by the time it had warmed up it was running brilliantly! The plan for this week while I’m off work is to gut it and give it a good clean up inside out and go from there really. There’s gonna be a lot of tapping and coaxing dented pieces of bodywork back into shape as old dear (RIP) clearly liked driving into things. Long term id like to go down the AFH and bike carb route but for now I’m in no rush and am happy with the 1.3 motor! Here’s some photos!